Sometimes nuggets of knowledge and understanding just seem to drift off into increasing fiction. Unfortunately the Internet and Wikipedia do not appear to help this; in many cases they are part of the cause. Lorenz Eitner (1919-2009) gained his PhD from Princeton University for his thesis on Géricault, and chaired the Department of Art and Architecture at Stanford University from 1955 until his retirement in 1989. He was the authority on Géricault over the last 40 years of the twentieth century, and even today’s harshly critical approach to previous art history has done little to question that reputation or reliability, at least not on matters of fact rather than interpretation and criticism. His 1972 monograph Géricault’s Raft of the Medusa provides great detail about the painting and its production in its 176 pages, much of which relies heavily on the biography and catalogue raisonné of Géricault written in the the 1860s by Charles Clément. Eitner provides several long sections translated from Clément, and most of the rest of Eitner’s description and analysis of the final painting process (pages 31-9) is rewritten from Clément’s words. Eitner (p 32) summarises Géricault’s process in writing that the recollections of those who had come to the studio during the final painting “show that he followed a method which David had introduced among French artists, and which Géricault may have learned from his former teacher, Pierre Guérin.” To Eitner, “the difficulties of this procedure were formidable” because of its “piecemeal execution” (p 33). However it is considerable more in accord with “the psychology of artistic work” and more straightforward in execution than, for instance, the painting of fresco, a task successfully accomplished by large numbers of professional painters over many centuries. Some of Eitner’s hyperbolic account of these difficulties (pp 32-3) reveals his naïvety. For example, he writes about the difficulty of the task “in the changing light of winter, spring, and summer”. The main reason that painting studios (in the northern hemisphere) are almost invariably lit from the north is to minimise diurnal and seasonal variation in the quality of the natural light entering them. The same issues are common to every painting undertaken over a period of more than a few days. Eitner does not comment on whether his examination of the final work showed similar evidence of differential brushwork according to the object being depicted. However Clément’s book – Eitner’s main source for his monograph – was first published in 1868, nearly 50 years after the completion of the painting. 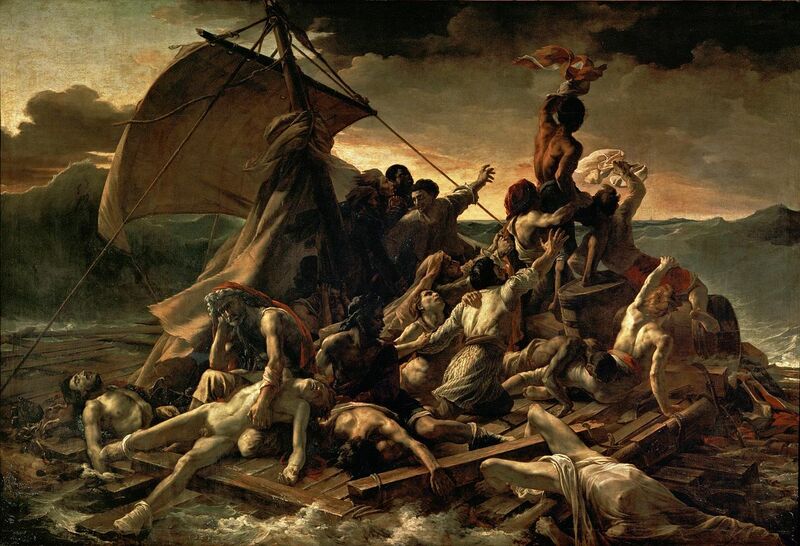 Clément’s account of the painting of The Raft of the Medusa relies heavily on an oral account by Antoine Alphonse Montfort (1802-1884), who was then aged 17 years and a “young” pupil of Horace Vernet (whose father had been Géricault’s teacher). According to Clément (p 138), Montfort had visited Géricault many times during the winter of 1818-9, when Géricault was in the early stages of painting the final work. Clément does not record when Montfort gave this oral account of what he saw in Géricault’s studio, but it could hardly have taken place before 1845, when Clément would have been a tender 24, Montfort aged 43 and recollecting what had happened nearly 25 years previously. It is more likely that Montfort gave his oral account to Clément during preparation of the biography, most probably around 1865, when Clément would have been 44, Montfort aged 63 and recollecting what had happened nearly 50 years previously. Neither Clément nor in his turn Eitner consider how accurate Montfort’s account would have been, nor any errors which might have arisen in Clément’s written notes of their meeting. The account recorded by Clément appears in largely verbatim translation in Eitner’s monograph, with some significant omissions. I therefore give Clément’s words below, and have emboldened and italicised those sections of significance. Jamar was Géricault’s studio assistant, who was present and assisting throughout the final painting period. The contents of Jamar’s note confirm the source for the lists of pigments given above, but regrettably Clément does not record when Jamar wrote that note. What is significant is that Jamar did not appear to provide any remarks on the size of brushes used by Géricault, the remarkably quick drying of the paint, or other peculiarities apparently recalled so clearly by Montfort. Montfort’s description of the oils used by Géricault is that they contained “huile grasse des plus siccatives”. In modern English terminology, this means linseed oil medium with added siccatives or drying agents. Indeed the published records of materials purchased by Géricault during the final painting include huile d’oeuillet, huile grasse, and essence: in English, poppyseed oil, regular linseed oil, and solvent (turpentine, or possibly petrol or oil of spike), respectively (Rosenthal 1980). The use, effects and dangers of siccatives or drying agents in oil paints were well known at the time, and Montfort was correct in reporting that their use could have caused the fine cracking or craquelure in the painting, as would rolling the canvas for transport, as he reports was done for the painting to be transported to England for exhibition after the Paris Salon of 1819. It is also of interest that Montfort is not quoted as having any concern for the excessive use of bitumen in the painting, nor its potential effect on the longevity or structural integrity of the paint film. This is most probably because, as reported by Eitner, the majority of the bitumen paint was applied late during the painting process, when Montfort was no longer accessing Géricault’s studio. Montfort reported that Géricault painted (at least the figures, during the winter of 1818-9 when Montfort had access to the studio) au premier coup, and without any ébauche, or underpainting. These terms are still used today, although the first is more usually given in its Italian equivalent, alla prima. Eitner correctly identifies this method as one used by David for painting the figures and key details in large works on canvas, and there was nothing particularly remarkable about its use by Géricault. Indeed, given the concentration of intertwined bodies in the centre of the painting, Géricault’s alla prima and morceaux approach was probably the most effective and efficient way of tackling the task. As I have remarked above, Eitner’s examination of the painting comes to different conclusions with respect to the size of brushes used. Whilst he concurs with Montfort that the figures were painted using relatively small brushes (not unusual given the nature of the subject), he states that larger brushes were used for the rest of the painting, something neither observed nor recalled by Montfort, who would only have seen Géricault working on the figures. Addition of solvents such as turpentine, petrol, or oil of spike. These reduce the viscosity of the paint, making it runny, but evaporate over a period of hours. The paint film left after evaporation then usually has a semi-dry surface, although it actually dries no more quickly. This is commonly used for underpainting en plein air, as it enables further paint to be applied quickly. However the underpainting remains reworkable. Addition of a resin such as damar or copal, usually dissolved in a solvent such as oil of spike. When the solvent evaporates the resin makes the remaining paint film very thick and appear almost dry. However the paint film does not actually dry any more quickly. Initially the film is more mechanically robust, thus suitable for overpainting as if wet-on-dry. However resins can leave weaker paint films in the longer term. I cannot find any mention of Géricault purchasing such resins in the records published by Rosenthal (1980). Addition of a wax such as beeswax. Waxes do not normally undergo any form of drying and may inhibit proper drying of the linseed oil in the paint itself. However they increase viscosity of the paint and can make it more mechanically robust, allowing early wet-on-dry painting to succeed. Catalysts, typically certain metal salts (at that time lead was still popular), which do actually accelerate the oxidation which occurs in drying oils such as linseed oil. These result in more rapid and true drying, but even so this will still take several days or weeks before even the surface skin of the paint film has dried. These metal salts can also result in long-term degradation of the paint film, including saponification, forming soap bubbles and further serious problems. Pre-treatment of the drying oil binder to encourage the early stages of polymerisation. The most common such treatment is heating the oil, something which Géricault’s assistant may have done, but is not reported as doing so. This increases the viscosity of the oil but it will still take several days or weeks before the surface skin of the paint film dries. Overheating can cause degradation of the oil and consequent weakness in the paint film. In the circumstances I consider it most likely that any siccative technique used could have included pre-treating the linseed oil by heating, which would have produced a thicker paint, and the addition of lead (and/or other siccative) metal salts. Temperatures during the winter in Paris are quite cold, although I can find no evidence of an exceptionally mild or cold winter in 1818-9. Typically December-February average maximum and minimum temperatures remain below 10˚C, and it is not until May that average maximum rises to 20˚C. In Géricault’s large studio in the Faubourg du Roule (to which he had moved to accommodate the huge canvas), temperature of the canvas would have remained within a very few degrees of that of the outside air. It is interesting that even modern acrylic paints are not recommended for use when temperatures fall below 10˚C because they do not polymerise properly; oil paints are more tolerant of low temperatures but dry very much more slowly. The reason for Géricault wanting to use siccative or drying agents when painting alla prima (as distinct from using multiple layers) is obscure. The most common reason for taking such risks is when intending to paint in layers, wet-on-dry, to reduce the waiting time required for the next layer to be applied. It is odd that Montfort, Clément, Eitner and all those who have subsequently relied on their accounts have not noticed this puzzle nor tried to solve it. Even if Géricault’s paint did dry each night so that a surface skin had formed, that would not prevent him from continuing previous work or adjusting it as he went along from day to day. Not only is it perfectly possible to scrape such drying paint back using a knife, but it is also straightforward to overpaint any corrections or adjustments on the forming skin. Such alterations are frequently noted in paintings, and are widely known as pentimenti (singular pentimento). It is thus misleading to claim that “each section, once begun, had to be completed that day” (Barnes 2015, p 22) or that his technique “left little opportunity for second thoughts” (Christiansen 2000). Assuming that Géricault painted seven days each week, during the seven months of December to June (Eitner estimates eight months of “painting almost without interruption from daybreak to dusk”, p 32), that provided a maximum of just over 200 days of painting available. His canvas is 491 by 716 mm in size, i.e. 351,556 square mm in area. This would have required Géricault to have painted an average area of 1758 square mm each day, the equivalent of a square of just 4.2 x 4.2 cm in size. Thus the remarkable technical achievement is more in his ability to sustain this rate of painting over the period of seven to eight months, not in the average coverage which he achieved. 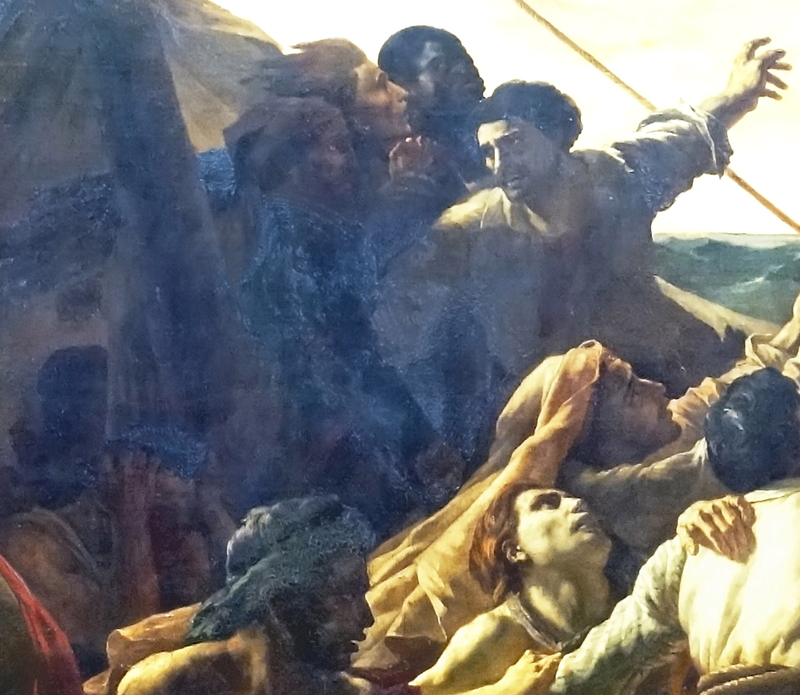 Théodore Géricault, The Raft of the Medusa (detail showing the deteriorating paint) (1818-9), oil on canvas, 491 x 716 cm, Musée du Louvre, Paris. Photo by Dennis Jarvis from Halifax, Canada, via Wikimedia Commons. Although hardly ever used now because of its consequent problems, pigments containing asphalt, bitumen, and related substances – which include Cassel Earth, also listed by Jamar as being on Géricault’s palette (Clément 1879, pp 141-2) – were extensively used in paintings over the period 1500-1900 (Bothe 2007). They were also widely discussed in available manuals and handbooks (Carlyle 2001, for example), where reports of their problems were given. Strangely, Eitner (p 37) states that “in his effort to obtain the most intense black possible, he lavishly used bitumen, which gave him a very satisfactory, glossy, raven black”, an error which has propagated back to Barnes and Wikipedia. All the technical documentation on asphalt, bitumen, Cassel Earth, and their relatives, gives their colour as being a very deep brown. Chromatically the peach and ivory blacks listed by Jamar as being in his palette would have given him the blackest black, particularly when finely ground. Objective testing of real asphalt-based pigments has shown that paints so produced may develop a hard surface skin which is prone to wrinkle and crack, while the paint inside remains relatively liquid. They are also quite sensitive to changes in temperature, liquefying in the heat. Furthermore, despite the common belief that they become darker with age, in fact their rich deep brown colour fades over time and becomes paler. These pigments were also well known for resulting in slowed drying of the paint film, and when not prepared properly, may prevent it from ever drying properly. Before any degradation in the paint film in Géricault’s work can be ascribed to the effects of bitumen, asphalt, Cassel Earth, siccatives, or any other ingredient, careful physical and careful examination would be necessary. Rolling large oil paintings, as was reportedly done to the canvas when it was moved for display in England, can also result in extensive damage to the paint film. Another widespread cause of liquefaction and loss of integrity is saponification, the formation of bubbles of soap within the paint layer. Unfortunately I have been unable to find any published record of conservation analysis of The Raft of the Medusa, and given its importance, am surprised that Eitner chose not to include information from a detailed physical examination of the painting in his monograph. The most recent account that I can find of The Raft of the Medusa and its historical interpretation is that of Athanassoglou-Kallmyer (2010). Sadly she does not give any account of the production of the final painting, but her silence ensures that she avoids the trap of hyperbole passed on from Montfort to Clément to Eitner to Barnes. I wonder whether Julian Barnes would wish to revise his essay on this painting in the light of any or all of the above. The motif of this great and vast painting is the tale of a shipwreck. Given that Géricault’s painstaking research resulted in a painting which is not true to any moment in time, it is ironic that subsequent publications about the painting and its production appear not to be true to the painting itself. Art history has here been shipwrecked on the rocks of multiple fallacies. Clément, Eitner, and all who have subsequently relied on them should have been more critical of the sources of the information which they uncritically repeated, despite the problems inherent in them. Anyone who writes a monograph about a painting should at the very least ensure that a skilled conservator examines the work, and should write consistently with those findings. Art history desperately needs better understanding of the materials and techniques of art. Just because you can give a reference does not make information or facts true. Online information sources propagate and amplify errors, and do little or nothing to help a more critical approach. Accuracy and wisdom grows from critical research, not from mere embellishment of what has been said before. Athanassoglou-Kallmyer N (2010) Théodore Géricault, Phaidon Press. ISBN 978 0 7148 4400 8. Barnes J (1989) A History of the World in 10½ Chapters, Jonathan Cape. Barnes J (2015) Keeping an Eye Open. Essays on Art, Jonathan Cape. Bothe CI (2007) Asphalt, chapter in Artists’ Pigments, A Handbook of Their History and Characteristics, volume 4, ed BH Berrie, Archetype Publications, pp. 111-149. Carlyle L (2001) The Artist’s Assistant. Oil Painting Instruction Manuals and Handbooks in Britain 1800-1900 with Reference to Selected Eighteenth Century Sources, Archetype Publications. Christiansen R (2000) The Victorian Visitors. Culture Shock in Nineteenth-Century Britain, Grove Press. Clément C (1879) Géricault. Étude Biographique et Critique avec Le Catalogue Raisonné de l’Oeuvre du Maitre, 3rd edn, Didier, Paris. Eitner L (1972) Géricault’s Raft of the Medusa, Phaidon Press. Gottsegen MD (2006) The Painter’s Handbook, revised edition, Watson-Guptill Publications. Rosenthal DA (1980) Géricault’s expenses for The Raft of the Medusa, The Art Bulletin vol 62 no 4, pp 638-640. Posted in General, Painting and tagged asphalt, Barnes, bitumen, Clément, drying, Eitner, Géricault, oil paint, Raft of the Medusa, Wikipedia. Bookmark the permalink.